Is it more industrial dancing????? Marko said he went off when he saw the guy in the bike helmet rofl. You wanna be part of my dance troupe? This was on tv the other night. I lol'd. You should watch everyone of this girls videos, shes hillarious. Oh man, i would of turned the car round and started putting my zombie invasion plan into place, no word of a lie! Well, my dog is kind of just one big (well, small) funny thing in himself, but he made me cry laughing so hard a few minutes ago. After he got done watching tv with my boyfriend and I, he was walking around on the floor and I heard him chewing on something. He's been finding beads somewhere, I have no idea where they're coming from, and he knows he's not allowed to chew on them. So when I said "Nebu, what do you have? It better not be a bead." He turned around, sat down real fast, put his ears down all innocent-like and looked at me from under a chair, with his mouth shut, tail wagging slightly. I said "SPIT IT OUT." And he just looked at me and tried to walk away as if he had nothing in his mouth. I almost believed him, but I went up to him, and opened him mouth, and tilted his head forward, and out pops a bead from under his tongue. He was trying to hide it from me like a freaking toddler! Pox, your dog sounds awesome. Thanks, It's kinda the ultimate practical joke in my eyes, looks amazing + no damage whatsoever. I'm still laughing now when I think about it..
starlight wrote: Pox, your dog sounds awesome. ha ha that is frigging awesome, how long did it take? 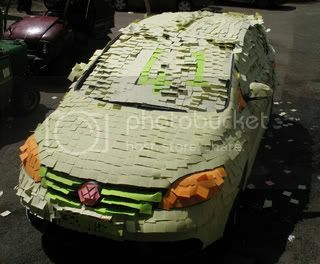 Post it note car!!! AWESOME! You should submit it to WIN! Got my breasteses pushed up, tryn ta distract immm..
Hahaha, honestly. She's so funny though. The royal wedding happened on my birthday, so they're going to be making it a holiday here in Canada too. WOO!! Payed days off on my birthday forever! OMG americans doing english people always makes me laugh!!! This was on Sunrise (breakfast tv show) this morning. Quite funny and pretty damn amazing! This is old, but I love it! Gromidez wrote: This is old, but I love it! Hmm all Im getting is "this video is private"..